Our overnight passage from the port town of Golfo Arancia in northeastern Sardinia back to Livorno, Italy could hardly have gone better. We selected the slowest overnight boat available to maximize the time for sleeping, boarded about 8:30 pm, and heard the wake-up knock on our cabin door at 6 am. It wasn't a perfect night's sleep, but quite good considering the extra sensations that come with sleeping at sea. Getting out of Livorno the next morning, however, didn't go as well. We racked up an extra 5-10 miles and chewed up more than an hour just trying to get around the new freeway not shown on our map. The still-leaning but stabilized tower. Our BikeLine bike route book from the German publisher must have been written before the freeway extension was completed, and we wore ourselves out in the process of understanding that and in looking for an alternative route. We gave up, pedaled from the maze of dead-end streets in the vast port area, and rode back to the center of town resigning ourselves to riding on the busy highway to Pisa. But just as we approached the highway, we saw 1 more road to try. Our elevated hopes were soon dashed as the new road quickly put us back in the familiar territory that led us onto the freeway. One thing had changed in the time we had been scrambling, which was that more cyclists were now on the road. We had noticed 1 heading towards the freeway and wondered if he ventured on to it or not. Our last ditch effort seemed a bit foolish, but it was to wait and see if another went by and to ask him about the road (recreational riders in Italy are almost always men). The lack of cyclists going by quickly made the new plan of waiting on the curb of the expressway approach feel absurd and about when we were ready to give up, a Lycra-clad man flew by. He was headed towards the freeway but refused to stop to answer Bill's question. Bill took off after him in a flash. I couldn't keep up but Bill was hot on his heels. The sleek cyclist on a feather-weight bike must have been chagrined to see that Bill stayed on his back wheel when there was likely 100 lbs more being propelled by Bill than the guy he was following. Bill was on a last-ditch mission and stuck to his back wheel like gum on a shoe. Bill finally dropped back to let me catch up and we paused on an overpass to track the last of the cyclist's route through the maze of freeway exits and ramps. Sure enough, after looping around like on a circus ride, he headed for the scenic coastal road that BikeLine had recommended. As we pedaled along at a more leisurely pace, we appreciated the role experience had played in the ultimately successful strategy. Had we been in Germany, we would have looked even longer and harder for a special little bike bypass that preserved the route despite the new freeway. In Germany, it would have been a sure bet though we knew that at least in this part of Italy, there was little chance for such accommodation. Given we were in Italy, the question quickly became "should we or shouldn't we" hop on the freeway. One trucker we asked had said "Yes" but given we couldn't see how many miles we would go before an exit, we weren't willing to risk a freeway detour. Once or twice a year we do a short stretch on freeways when the expected or promised connections just aren't there, but this heavily traveled, elevated freeway wasn't a good gamble. But all it took was the sight of 1 cyclist on it to make us willing to give it a try. And indeed, we never were really on the freeway, just the extended, multiple branching approaches. The sign had said "No Bikes" but we knew that in Italy "No" doesn't mean quite the same thing as it does in America--it's more of a yellow traffic light than a red. We expected to arrive in nearby Pisa in the time it took us to finally leave Livorno, but fortunately it was planned as a short riding day. And the shrinking time for activities became inconsequential when we discovered that the archeology museum that surely must be in Pisa didn't exist and the maritime museum that did exist was in the middle of a many-years closure. 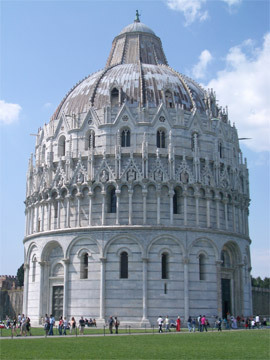 Suddenly our Pisa sightseeing was down to revisiting the most famous architecture and our 2 night stay was reduced to 1. The striped arches of Pisa's Duomo. 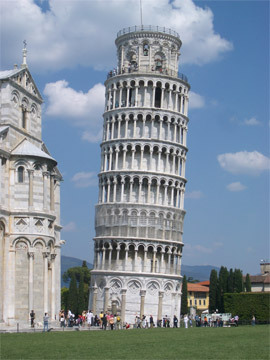 Our first visit to Pisa was in 2001 in the first months of our European cyclotouring and the famous leaning tower was being shored up with strong cables, which were now gone. We declined to pay the $18 each to tour inside the still-leaning but rescued monument and settled for the less expensive Duomo and Baptistery. Bill remembered the Duomo, or cathedral, as his favorite church in all of Europe but was disappointed once back inside. It wasn't as big or as grand as he remembered it, nor was the Baptistery. The Duomo had been diminished by all of the other phenomenal things we'd seen in the intervening years but those experiences also gave us some new insights. Our guide book noted that this 1064 Romanesque church was the trend setter for Tuscany and Sardinia for years to come yet when we looked at it, we thought of who might have really been the tread setter. The Duomo's great, slightly pointed outer row of arches and the distinctive horizontal banding from 2 different colors of marble looked remarkably like the Grand Mosque in Cordoba in the Andalusian region of southern Spain. A quick reference check of facts and figures eliminated any doubts as to the plausibility of the theory, as construction on the Grand Mosque began in the middle of the 700's. By the 10th century, Cordoba was the largest and most cultured city in all of Europe and was the #3 city in all of the west behind Baghdad and what is now Istanbul. 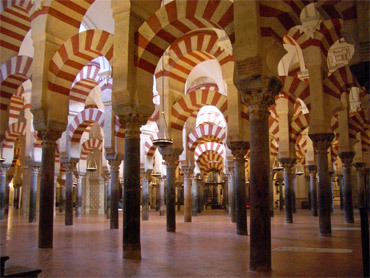 The striped arches in Cordoba's Grand Mosque. Surely the newly prosperous and maritime Pisans had been to Cordoba, as they were rising to power late in the 9th century. It would only make sense that they would have looked to the European tread-setters for inspiration as they embarked on their own building spree to punctuate their increasing power. Of course, nothing we had available could confirm or deny our theory, though we'll be listening for tidbits on art history with this new question in mind. Lucca was next on our must-see list for our revisiting of this region of western Italy. In 2001 we were overnight guests of Portland friends Cheryl and Terry that had rented a rural villa outside of Lucca, but we never actually made it into the famous city itself. Less known Lucca (probably because it lacked a fleet) was one of the great Italian powerhouses along with others like Venice, Genoa, Milan and Florence. Lucca commanded respect in commerce as did the other important cities, but held its position through diplomacy rather than the use of artillery. Lucca's rise as a commercial center was boosted by controlling a part of the pilgrims route between Rome and France, the via Francigena, and more curiously, by absorbing fleeing weavers. The Arab conquest of Sicily in the 800's had resulted in the development of workshops producing sumptuous fabrics on the island in the following years. When the French invaded Sicily 4 centuries later, the weavers fled to Tuscany, with many settling in Lucca. Lucca rapidly became famous for its silk fabrics--so famous that the Florentines later stole some of Lucca's weavers. Lucca established trading centers around Europe to support its industries and its merchant families became fabulously wealthy and financed lavish building projects. 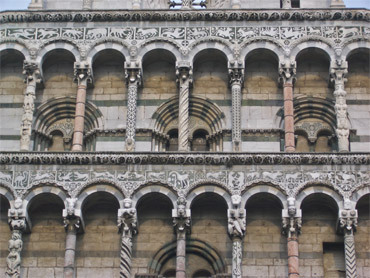 Lucca's wealthy patrons financed their own stripes & columns. Diplomacy was Lucca's strong-suit for defense, though as a back-up, it constructed a thick, 2 mile perimeter of defensive walls around it during the Renaissance. It is the combination of these still-intact defense walls and the old stone city contained within it that makes it a draw for many tourists. In its center it has a huge ellipsoid town square, the shape of which reflects the perimeter of the ancient Roman theatre that once stood there. We had learned elsewhere that such arenas were often used in the Dark Ages as a back wall for many urban dwellings and gradually became filled-in with small buildings. "Carrara" sounds familiar doesn't it? It's because of the phrase "Carrara marble" which comes from the vast quarries between Pisa and Genoa. In 2001 we looked up at the huge gashes in the mountains from the quarrying and stopped to stare at the single, massive blocks of marble hauled on 18 wheeled trucks. Scrap marble was used everywhere in the area: as rip-rap at the harbors, as roadside barriers, and for outdoor sinks in our campground. This year we vowed to get closer and hoped to visit the quarry itself. The trip into Carrara was one of our more difficult quests, though it had seemed simple enough. We'd ridden for miles on the perfectly flat seashore lined with private sunbathing beaches with their vacant bars and cabanas. It was clearly a holiday strip that would be overflowing in a few months but it made for peaceful riding on our damp, off season days. Visiting Carrara only required making a 90° turn to the right and heading inland a couple of miles. But the world changed with that simple turn, as now we were on a road that was a conveyor belt of mammoth trucks hauling chunks of the marble mountain down to the port one piece at a time. The deafening roar on the 4 lane truck route through the middle of town made it hard to think. One gleaming new 'marble on marble' public square offered a lovely visual relief from the intensity of the road, but it wasn't enough of an antidote for us. As we pedaled along, terribly outsized by the truck traffic, I decided that the 'color of money' in Carrara was white, as the fine white marble dust from the thundering trucks coated everything, including us. Like in too many other towns in Italy this year, the tourist information office was permanently closed in Carrara though the directional signs were still up. Our guide book offered scant information about lodging and the marble museum, so we had been counting on the tourism office to make our anticipated visit to Carrara become a reality. We wanted a quick trip to tourist info to direct us to a conveniently placed hotel so we could leisurely visit the museum the next morning. We also expected them to tell us how to take a tour of the quarries by bus and perhaps suggesting other quarry-related gems that we hadn't imagined. But my big Carrara visit was nearly a bust. There was no tourist info office and the only hotel we found was too pricey. With difficulty, we located the museum, and opted for a rushed visit before they closed for the day. In doing so we missed the opportunity to see 3 of their 4 videos and had to scoot through the exhibits too quickly. Their table of info brochures indicated that quarry tours were only available for tour groups with their own bus, and only for a few weeks in high season. We reluctantly decided to cut our losses with the short museum visit and then rode back down to the sea for more lodging choices. Pushing harder on this one didn't look like it would get us the marble quarry experience we'd hoped for. What we did learn at the Museo del Marmo was that the marble, which is re-crystallized limestone, had its beginning about 200 million years ago as ocean sediment. 60 million years ago when the land masses on the planet were colliding and the ocean floors were lifting, the process of compression and folding the sediment really got rolling. And it wasn't until 27 million years ago that the changes in the crystalline structure that made the sediment into marble occurred. And who else but the Romans started exploiting the fine shades of marble because of its high quality and its proximity to a seaport which allowed for easier transport. Once again we learned that the quarrying technologies used at Carrara and many other places didn't change much from the time of the Romans until about the 20th century. The Romans cut through the stone not with a serrated saw but a dull iron blade that did its cutting by forcing the flinty sand underneath it into the marble, a technique still used until about 1900. The Romans brought the massive blocks of stone down from the quarries on wooden sledges, a technique used late into the 20th century. 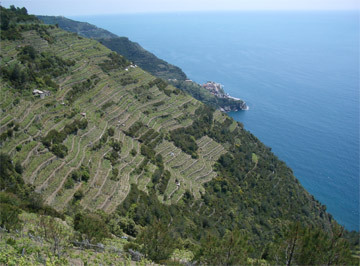 A view of the steep, terraced Cinque Terra slopes from the top. The most interesting modern innovation in quarrying was in the late 1880's with the use of elaborate pulley systems with mile-long heliocollidal wires that replaced grit and dull blades to cut the stone. The constantly moving wire had to be incredibly long to allow it sufficient time to cool. This system using 3 intertwined wires was the preferred cutting technique until a similarly long wire with diamonds imbedded in it recently became the new cutting edge. The next day we rode in light, intermittent rain past Lerici, a very beautiful little harbor town we'd camped near in 2001. I'd looked forward to revisiting it, but I knew that it had no hope of matching my sunny-day memories by visiting it in the rain. We opted for stopping on the high road to admire it from afar rather than taking the steep roads down to it and then back up. This little stretch of revisiting the Italian coast had been a disappointment, but like at Carrara, we decided to continue on with our journey rather than push on something that wasn't likely to live up to our expectations. 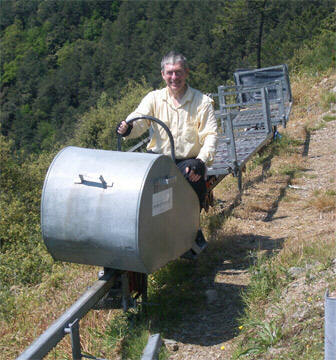 Trying out a farmer's monorail used on the steep terraces. We headed on to Cinque Terre, a wildly popular stretch of western Italian coastline, especially with Americans, and with good reason. It is long on charm and the opportunity for an all-day walk the length of it allows you to immerse yourself rather than just view it like a museum piece. 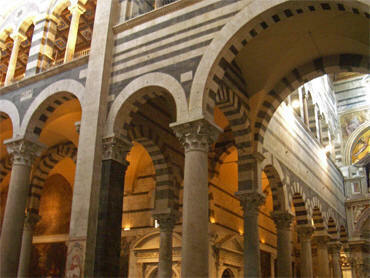 And being located between Pisa and Genoa makes it easy to include in many itineraries. Luckily for us, the drizzly rain and wind were moving beyond us, improving our prospects for a satisfying visit. 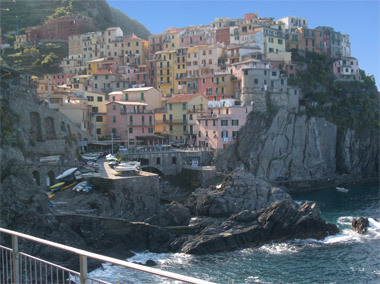 "Cinque Terre" or "5 Lands" refers to the 5 villages perched on incredibly steep slopes, most of which are at the water's edge. Over 4,000 miles of dry stone walls prop up these towering slopes and provide winding strips of flat land on which to grow grapes and olives. Walking within the villages themselves is fun, with many of them being crisscrossed with steeply graded, narrow stone passageways between the homes. One quickly feels like a rat in a maze in some as you have no idea where you will emerge when you finally pop out into a break in the high walls. And walking the steep paths between the villages is even more challenging and scenic. 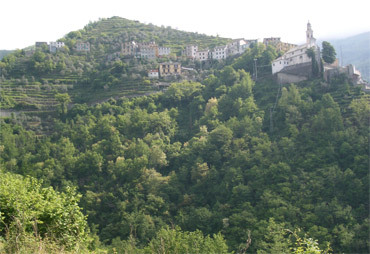 On a hot and humid day in July 2001we made a day trip to the area and walked the open portion of Cinque Terre trail between the villages. But Bill crafted a different visit for us in May of 2006: we spent 1 night in 1 of the villages and then biked the much higher secondary road above the area. It was a treat to over-night in the celebrated village but the next day was astonishingly difficult. The best we could do was push our bikes up the steep, cobbled pedestrian zone of our overnight seaside village of Manarola and then began pedaling once the grade dropped into the lower teens. Even once out of the village, it was sooo steep for so long that I stopped frequently to pace myself as neither of us knew if the fierce grades were going to be dished-out for minutes or hours that day. Manarola, our overnight village in Cinque Terra. Many things we've done during our cyclotouring adventures fall into the "once is enough" category and biking through the urban sprawl of the Genoa area was one of them. Few cities are pleasant to bike through (though some are delightful for biking within) and the heavy truck traffic on the approach to Genoa made it very unpleasant in 2005. By chance, the timing fell into place perfectly and we were positioned for a Sunday morning dart through the worst of Genoa. We learned that lesson in Greece--that early Sunday morning is a great time to skirt through a difficult urban traffic area. But still, we'd been on the peripheral roads before and were dreading them. A late night change of plans had Map Man's head spinning, but it would have us skirting north of Genoa through the hills instead of pedaling for miles through the city itself. The route through the hills would be easier on our nerves but more athletically demanding. And there was an additional problem of scant lodging. Map Man wrung every bit of information out of our resources and came up with enough lodging prospects to barely make the alternate route a "Go." The first day would be quite short to maximize the few lodging prospects and to shorten the next riding day that would end with a serious climb. During Day 1 on the alternate route we congratulated ourselves repeatedly for the success of the last minute itinerary as after the intense traffic out of Genoa, conditions improved dramatically. We were riding through green valleys and pleasant villages instead of mixing it up with the trucks. We arrived calm and fresh at our destination village around 3:30 on Saturday afternoon despite our late start and stopping to stock-up on food before the markets closed until Monday morning. We had 3 prospects for lodging and headed out to the first one, an 'agrotourism' place, which usually means it is a little more remote and more expensive. After struggling up 15% grades, we finally parked and I opted to walk what looked like a short distance to the door. Our potential hosts weren't at the top of the hill as we thought, but down the other side on a gravel road. Their 15% grade private gravel road was no way to begin our long day the next morning and so we decided to check out the other options. Just in case we needed it, Bill jotted down their phone number from one of the signs and we headed back down the steep hill. The #2 choice back in town looked like a dive and was closed on Saturdays anyway so it wasn't even an option. Choice #3 was back a few miles down the gentle grade, which would lengthen the riding day Bill had tried so hard to shortened. We headed up another steep hill off the main road and then stopped for brief talk with the neighbors as no hotel was insight even though we'd been following their signs. The neighborhood women indicated that the little establishment was about a 5 minute walk through fields on a foot path. Bill reported back that despite the unusual lack of a road, it looked like a very nice place but that no one was home. We were urged to wait an hour or 2 but we needed to be off the road before dark. It was 5:30 now, time for dinner and showers, but we had no place for the night. Now it was back down this steep little hill to the main road to find a pay phone. After a dozen attempts at dialing, a man finally answered at the agrotourism place and too quickly said that they were full. Even in Italian it made me wonder if perhaps it was too late in the day to bother with us, perhaps as their only guests. But my attempts to solicit help from him in finding another place made him impatient and that was the end of the call. Our agrotourism room was up past the last buildings on this hill. Bill noticed a second agrotoursim establishment advertising on a road sign that we had passed by several times, though their signs pointed up another valley. One sign indicated that the village it was in was only 3 km away (just under 2 miles), so despite it likely being up an unwelcome hill, we decided to try it rather than retreat many miles back on our route. Another phone call in Italian established the price, which was more than we wanted to pay, and that they had a room available. I tried unsuccessfully to explain where we were on the road to determine just how far away they were and finally said we'd be there in about 20 minutes. My estimate was generous for 3 km as under the worst of conditions we'd usually do that distance in about 30 minutes. We pedaled and pedaled and the road got steeper and steeper. At the 3 kilometer point, an inquiry with a resident suggested that our place was still another 2 km away. What we finally understood after an hour on the road was that 3 km was the distance to the perimeter of the 'commune' and the village by the same name was another 4.5 km up the challenging mountain road. That revelation was exasperating and it didn't help that the shadows on our side of the mountain were getting disturbingly long. Huffing and puffing up stretches of 10-15% grades when we normally would have been washing dinner dishes and wringing out clothes was deeply depleting. We had to stop often to let our legs recover. But frequent stops lengthens the whole process and so then we had to stop to snack. Our intentionally easy day with just under 800' in elevation gain to leave us fresh for a big following day just had another 1000'+ in gain tacked on to it, with 2/3's of it in just over 2 miles. When we finally arrived it was unbelievable--this little, overpriced agrotoursim place was like all the other houses perched on the steep, steep slope at what looked like the end of the road. We quickly chilled unloading the bikes as the fog rolled in between the peaks. Instead of the cheery lady of the house who had answered the phone, we were greeted by a man of few words that we weren't sure was going to invite us in. 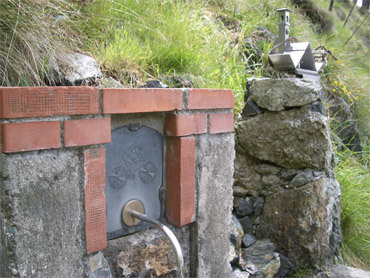 A small roadside fountain and shrine for cyclists in the hills. Once we got our foot in the door the first order of business was to close the windows in our unheated room. It was 8pm by the time we had our gear in but at least the water for showers was hot. About once a year we have a close call with finding accommodations and we hoped that this was it for 2006. But aside from the worse-than-expected scenario for securing lodging one night, the Genoa-bypass was great. Our route selection was otherwise a gem, as was confirmed by the many riders from our starting point on the coast of Sestri Levante and riders from Genoa itself. We again enjoyed the lush backdrop, the hills, and the mostly quiet roads as we rode more of the route the following day. It was Sunday and you know you are on the right route in Italy on Sunday if there are swarms of other riders, and there were. The passion for cycling was evident for each of several days as we passed by commemorative monuments, sculptures and fountains dedicated to cycling and cyclists. 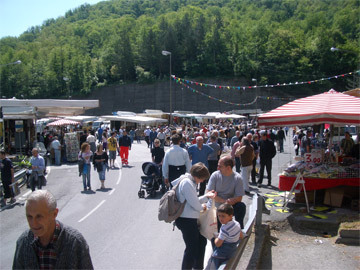 As we had in prior years in parts of France and Italy, we were bumping into spring festival weekends in this region of Italy. If we weren't actually rolling through the area on the big weekend, the many posters and signs announcing the events would alert us to the upcoming schedule. The reasons for the events would cover the gamut: displays of new cars, flea markets, flower shows, and multi-day events with free music and fireworks. It reminded me that many of the Christian holidays were crafted to weave in long-standing pagan events and these outdoor events made it look like the Christian calendar hadn't fully met the yearnings for an fresh-air spring fest to celebrate the season. The spring street festival swamped this road junction for 2 days. Even after seeing a number of events, we were blown away by a really big one north of Genoa that totally consumed a major 3-way junction. Parked cars narrowed the already too-narrow road for a mile or so and the throngs walking back to their cars added to the commotion as we approached the epicenter. We could translate enough of the Italian to determine that the week-end long event that was totally disrupting traffic was in honor of animals. In walking around the crossroads street fair I did finally spot the animals off in one corner, that included a range of horses, rabbits and sheep. But budget-priced slippers, roto-tillers, local sausage, and imported household gadgets were more prominent. Like the other events we'd seen, it was an infectious atmosphere that pulled us off our bikes to absorb some of the lively energy on a beautiful spring day. Despite the many joys, we've learned that for us one of the downsides of biking north to the Alps in the early summer is the high pollen count. Bill suffers much more than I do and when we look around, we know we aren't alone. Other people were walking with hankies in their hands or held to their faces and we heard still others ringing out their sneezing fits like we did on the worst days. Even some of the other cyclists were mopping up as they rode. As expected, as we pedaled north our allergies were getting worse and we were stopping more frequently to deal with itchy, runny eyes. We could blow our noses, pop another antihistamine, or dab streaming eyes while pedaling, but the serious eye maintenance required increasingly frequent stops. As our rituals evolved, the first step was rinsing the eye area and eye brow with either a stream of water from a bottle or patting the area clean with a soggy tissue to remove the invisible grit and pollen. Then the eye drops, either the antihistamine ones to interrupt the raging allergic reaction or the newer technology ones that prevent the histamine release from happening. Next we waited for the stinging and clouding of vision to pass. After the 5 minutes process, it was back on the bikes until the tearing and itching was too much to endure. And as allergy sufferers know, once your system is triggered, then everything out there is more noxious. For me, its cigarette smoke and some laundry product perfumes that become super-powered at offending my nose. Bill becomes especially sensitive to sunlight and has to pop the darkest lenses in his interchangeable-lens sport glasses until after his season peaks. What we learned some days later was that my unexpected bout of asthma wasn't likely caused by pollution at all but a cold--which is my other trigger. The tip-off was when Bill developed a doozy of a respiratory infection. The drippy nose part of it was minimal but the sore throat and over week-long cough made him miserable. We took 4 rest days over the course of about 10 days because of his distress. We wouldn't have believed it but this is the second time that my only symptoms of having a cold was a bout of asthma and yet Bill got nailed--the other time we were in Vienna and he was in bed for days. Unlike at home, traveling gives a reason to hope that ones allergies will be better tomorrow. At home I could look at the calendar and know how many weeks of hay fever were in my future, but when traveling there is also the possibility that the pollen count of whatever is bothering us will be lower in the next valley or from the next hill top. Despite the allergies, the draw of biking the stunning mountains is irresistible and late spring is the time to be there. Bill is always watching carefully to determine when the mountain passes are free of snow so we can complete our treks over the passes before the soaring prices of the summer high season set in. So we continued on, dabbing our eyes and blowing our noses as we headed into the western Alps. We are back in Italy or still in Italy, depending on your perspective. We are in the regional city of Trento having just completed our tour of the small Brenta Dolomites to the west of the main mass of Dolomites. Next it is on to the main region of the Dolomiti Alps, which we've seen before and love. Bill has been busy looking for new sites and passes for us there. It's been sizzling hot--in the 90's--which makes for challenging cycling. We keep thinking it should be cool in the mountains but the only relief is the lower humidity and night time cooling that the lower regions don't enjoy.